Grooming is among the most important parts in taking care of a horse. It is the perfect get-together time between you and your horse, a combination of beautifying and bonding. Grooming horses are much harder than grooming other animals. Their mane is comparatively large and a good grooming kit would help the process become much easier. And now, take a closer look at our picks of the best horse grooming kits on the market. What does a horse grooming include? Why would you need a horse grooming kit? How do you choose the best horse grooming kit? Q1: Can I use my normal hair comb to groom my horse? Q2: How do I properly grooming my horse? Q3: When and how often should I groom my horse? Q4: Which one is more preferred: to buy seperate grooming tools or to buy a full grooming kit? There are reasons to name this grooming tools set a” comfort” grooming kit. 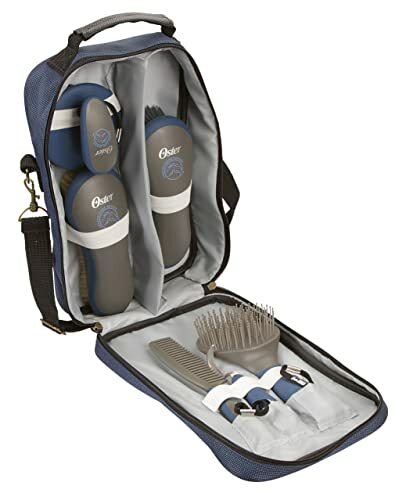 Providing the most basic tools for grooming while staying lightweight, fashionable and convenient, Derby Premium Comfort Grooming Kit is indeed a beginner’s dream. With a children-friendly design, the tools are extremely easy to hold, use, clean and store. These high-quality brushes can effortlessly survive seasons of camps, pony clubs and general day to day use. 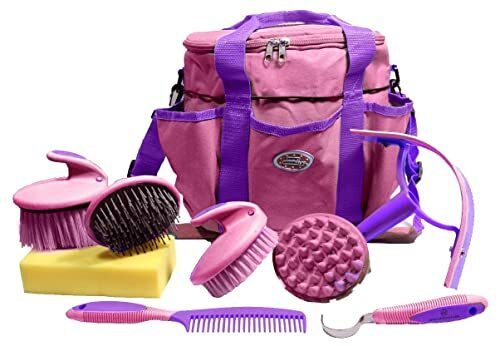 The kit is also considerably budget-friendly, suitable for kids and anyone who wants to try grooming their horse for the first time. This is a take-away grooming kit, one durable choice that you can carry around anywhere. With a fairly high price point, this sleek and modern kit gives out the most durable product form, with secure hand griffs and a matte finish for packaging. 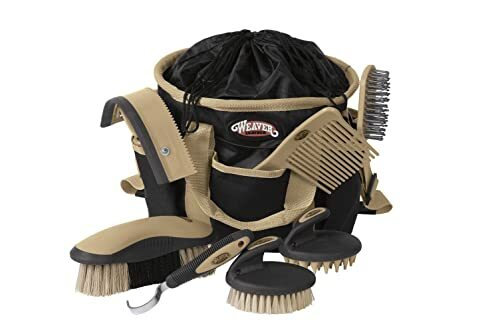 Though serving all purposes from fast grooming to whole-body grooming, it is extremely travel-ready, packed with everything you need for your beloved horse. It would work perfectly as a gift for any busy horse breeder or it can be just the starting kit you are looking for the pro-horse breeding journey ahead. 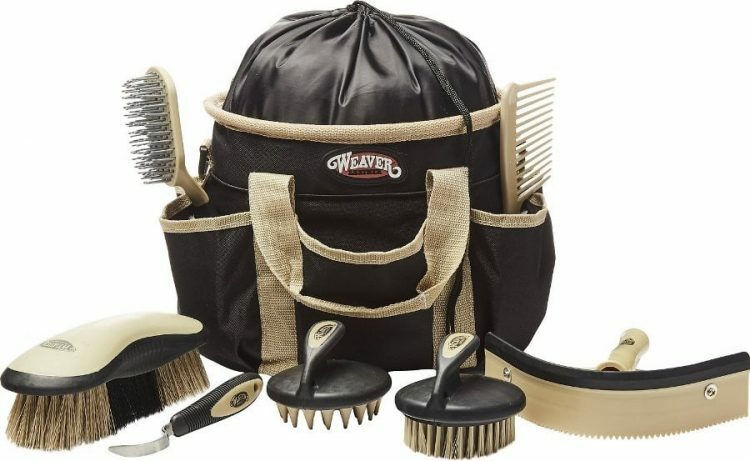 This kit is an all-in-one kit, providing mostly everything you need for successful horse grooming. It is designed to utilize your grooming experience, making grooming easier, faster and more convenient. The brushes are shaped to fit comfortably in the hand while looking stylish and sleek. The bag is very convenient with extra pockets for extra space, comfortable shoulder strap to carry the kit to any distance and strong material to last extremely long. The included products are very basic and with the built-in extra pockets, you can easily carry tools for other purposes as well as carry treats for the horse, which would help grooming more fun in practice. Grooming is an activity that is enjoyable for both you and your horse, a must before any ride to increase trust level between the horse and you. Grooming is bonding, a given space for your horse to meet you more often and for you to understand your horse better through talking, treating and cleaning. The horse’s physical appearance is enhanced for horse shows or other types of competition. A clean horse is a happy horse. It is also a good opportunity to check for minor injuries and irritations under their mane, keeping them healthy and beautiful at all time. Horse mane is comparatively thick and there would also be minor injuries which are hard to identify just by looking. Living in areas such as fields, barns or warehouse may increase the chance of horses attacked by insects. There are 3 main things to note when choosing a grooming kit. Not all grooming kits would include the tools that you want. It varies from brands to brands, product lines to product lines, therefore, you need to figure out which tools you need first. It depends on your grooming habit, your frequency of cleaning and how familiar you are with grooming. Finding the kit of your dream can be quite difficult and not every kit on the market would include the tools you want. Prepare to buy extra separate tools if needed. Save your time and scroll downward for the best grooming kits on the market for diverse purposes. Materials are the key to good tools. Therefore, each piece in a grooming kit should be made from specific materials in order to utilize their functions. Currycombs: It should be made from rubber or plastic. The hair should firm enough to do the job but not so hard that it will injure your horse’s skin. Combs: It should be made from plastic, rubber or metal. Since most grooming tools are prompted to reduce the pain when grooming on horses’ skin, it is advised to avoid metal. Bags are usually the preferred holding unit of the kit since they are handy, lightweight and easy to carry around. A good bag would mean a million things when it comes to horse grooming. Working in such an environment with dirt, the sun and other characteristics, the kit bag should be durable, easy to clean and provide straps or such for travel purposes. There are various other characteristics with the bag or box that you would probably need, depending on how often and where you would use the kit. Think about what you want at the product for easier searching and choosing process. Since normal combs are made for human hair with other criteria to pay attention to. Either made of wood or plastic, the comb’s hair would be very hard for horses’ skin, causing serious injuries and irritation if used too frequently and strong. It is advised to invest in grooming tools for a better process of beautifying your horses. There are many ways to groom your horse, depending on the habit of the breeder. Horse grooming can be done daily at any time your horse feeling calmed and relax. If your horse lives outside in a herd situation and does not wear rugs, the only grooming you need to do is just before you ride him or her. During those times of the year when horses are shedding, their coat you can do your horse a favor by grooming him or her. A horse that is living outside does not necessarily have to have their feet picked out everyday. It is quite natural for the soil to build up in the hooves. This mainly depends on your needs purposes when buying this specific type of tool. If you are new to grooming, it is advised to buy a whole kit since a single purchase of these tools requires knowledge and prior experience. It can take a lot of time researching to form a perfect kit using products from multiple brands at the beginning. If you have already had somewhat experiences with grooming, trying out new tools would be much easier to choose the right tool for your own grooming habit. That was some detailed information on horse grooming as well as the best horse grooming kits in 2019. Hope this article would come in handy along with your grooming journey.